When FC Barcelona presented the Club’s financial accounts on Tuesday, there was one figure that stuck out — $1.05bn. That’s right, you read that correctly. The Catalan Club earned 10 figures in revenues for the 2017/2018 fiscal year, making it the first sports club to ever do so. Not surprisingly, the global media were quick to pick up on the milestone, with prestigious international news organizations touting the feat almost in unison. The prestigious American business magazine, Forbes, led the way with two separate stories: "FC Barcelona First Team Ever To Surpass $1 Billion In Revenue" and "How FC Barcelona Nearly Doubled Its Revenue From $575m To Over $1b In Just Six Seasons." The Nikkei, Inc- owned and London-headquartered Financial Times said, "FC Barcelona nets record revenue of €914m, nearing goal of €1bn," while The Daily Mail sourced the news from the AP like several of its American counterparts. 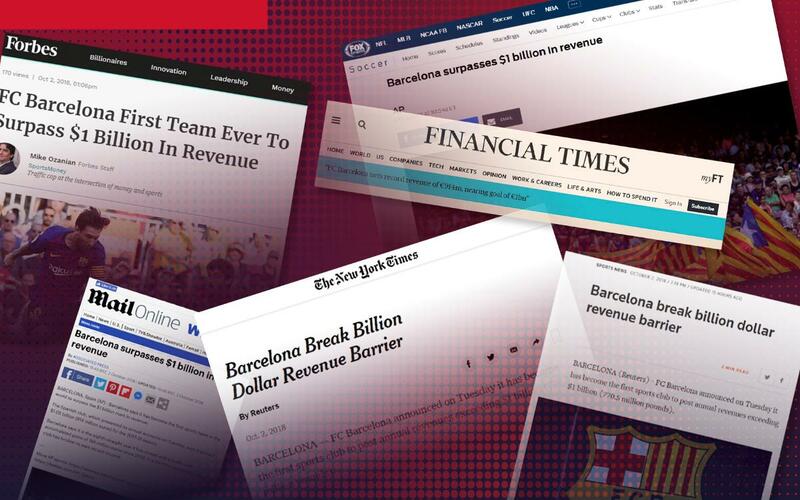 Reuters went with the headline: "Barcelona break billion dollar revenue barrier." The Sun, however, employed a dash of hyperbole to capture the magnitude of the event just right: "BARCA'S BILLION. Barcelona are first ever $1bn sports club as staggering revenue figures are announced. The La Liga giants smashed their target of reaching the $1bn mark four years earlier than anticipated." The big news also extended across the world's biggest continent and out the edges of the South Pacific, where three other major news outlets echoed the AP piece — The Indian Express, the Hong Kong edition of China Daily, and Australia's The Daily Examiner. Another Indian outlet, News18, sourced the Reuters story.